Since 1992 Valériane has been actively involved in the ecological movement, promoting sustainable development and raising public awareness about the forces that drive climate change. Since a young age she foresaw that only genuine personal engagement between people could create a quality of life in the human family. Committing to peace through meditation and creating tools of awareness to advance the condition of women, promote fair relationships with our environment, resolve workplace disharmony and broaden cultural understanding, she has made her home in six countries and continues to build bridges of understanding between cultures. Guest speaker: Valériane Bernard, is the Brahma Kumaris representative to the United Nations, Geneva and is visiting as part of the international BK Green Team. 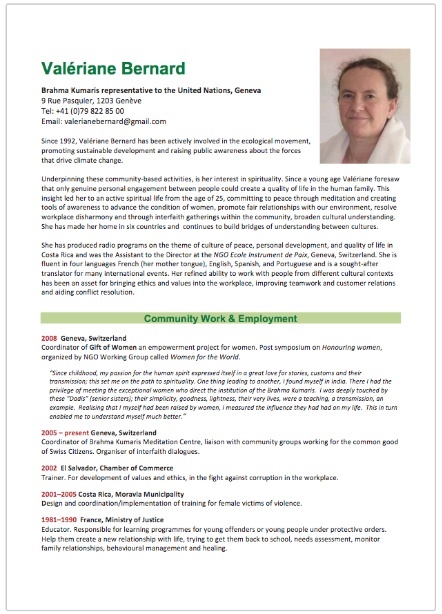 Coordinator of Gift of Women, an empowerment post symposium on honouring women, organized by the NGO Working Group called Women for the World, Geneva, Switzerland. The fortnightly talks empower by tapping into our strength and how we put our strength to work. We invite outstanding women to listen to their interesting turn weakness into strengths and work our strengths and empower ourself. There will be meditation, talk, dialogue and networking opportunities.